Today is the biggest (college football) game of the year in our house! Yes, we are a house divided. Michigan State vs. Notre Dame. It will be a day of good-natured (basically) jabs and yelling at the tv and cheering at the top of our lungs and of course, showing support for our favorite team by wearing (and eating) team colors. Though on this day it's mostly about the football, you've got to know that food is always running through my mind, so there's no way it wouldn't play a major supporting roll. This year I was excited to learn about Smiley Cookies. I know I've seen them before. Or maybe they were knock-off's. But now that I've actually had the pleasure of being able to order personalized (team!) colors and put them to the test, they will become a permanent fixture at our yearly match-ups. And that's just to start with. I can see myself ordering them for all sorts of occasions. Or when the mood strikes. packaging: These cookies were shipped in their packaging inside of a very sturdy (and adorable) box decorated with layers of Smiley Cookies. This box was wrapped in packing material and fit snuggly inside a shipping box. They were well-packed and I received them in perfect condition. It was a joy to open the brown packing box to pull out the bright and colorful box nestled within. And it only got better when I opened that box to pull out the cookies that were tiled into their plastic sleeves vertically. appearance: These cookies are utterly irresistible. Not a person, young or old was able to walk by them without reaching out to grab one. Plus, with their customizable color schemes, you're guaranteed to please your guests and/or match any theme you hope to convey. taste/texture: These taste like classic sugar cookies - not too soft, not too crunchy, they fit comfortably in between the two with a pleasantly crumbly texture. The icing is not a soft icing, it is "set" like a thin, perfect shell that coats the top. Overall, the cookie is sweet, but not overly so. It's a pretty big cookie, and I think the sweet level is just right. Have a glass of cold milk nearby and you may not even want to stop after one. 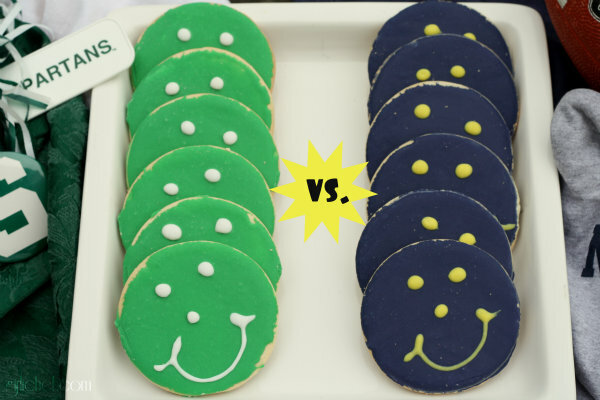 about: Smiley Cookies got their start at the Eat 'n Park restaurant more than 20 years ago as a way for the restaurant to share their spirit with the community around them. It signified a commitment to community and charitable giving, as well as a "delightful family dining experience". They even have a six-foot walking sugar cookie (with signature smiley face) as their mascot. Each child who dines at the Eat 'n Park receives one of these now-famous sugar cookies (totaling over 1 million free cookies every year). 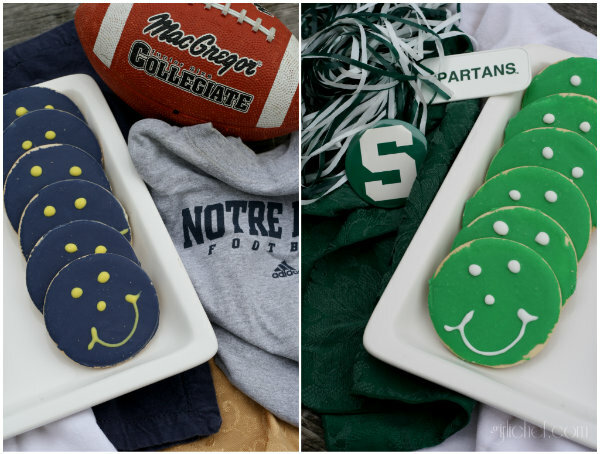 Plus, over 200,000 smiley cookies are donated to local non-profit organizations yearly. And now, those of us who live in the US, but not anywhere near the Eat 'n Park in Pittsburgh, Pennsylvania are able to have these smiles delivered right to our doors by ordering (and customizing) them online. You can order the traditional cookies (circle with a smile), but you can also get special holiday shapes like hearts, shamrocks, bunnies, and jack-o-lanters, not to mention flowers and more! 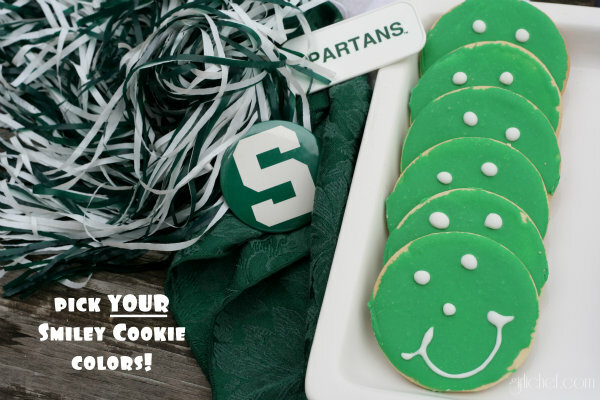 Plus, the colors are customizable to match weddings, school colors, corporate logos, sports teams - or whatever you can think of. my thoughts/review: I love them! As did everyone else in the family and the friends we had over. The sugar cookie taste, the soft, yet slightly crunchy and crumbly texture, the fact that I can personalize them however I like - perfect. I can see myself ordering all sort of colors and shapes in the future. Parties, school events, holidays, Tuesdays - it's happenin'. 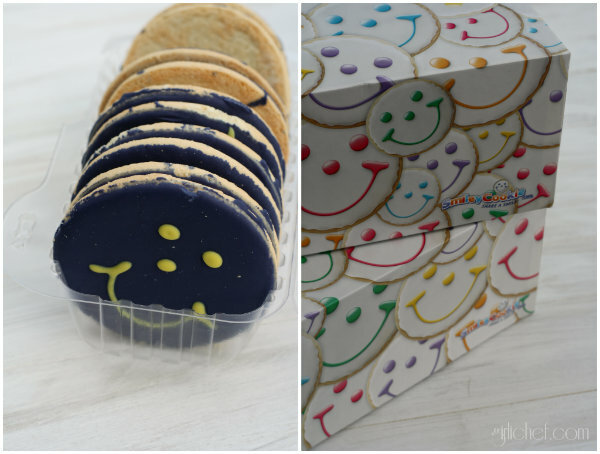 *I received two free packages of Smiley Cookies to taste and review. All opinions stated in this post are 100% my own. Those cookies looks so cute! :) I can add to the noise in your house!